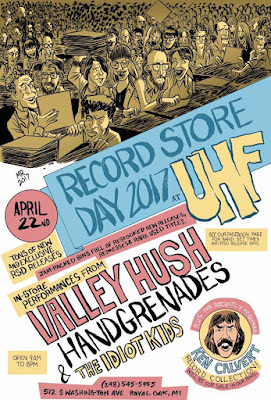 Hip In Detroit: Celebrate Record Store Day at UHF! Celebrate Record Store Day at UHF! This Saturday is Record Store Day and UHF in Royal Oak has something a little special planned for all of you. In addition to stocking their shelves with the exclusive RSD releases, they try to have some in-store entertainment every year for this special day, and this year their lineup is stacked! They are bringing out Valley Hush, along with Handgrenades and The Idiot Kids. This would be an amazing show on its own and would pack any venue in town. So seeing these bands in the super intimate setting at UHF is going to be absolutely awesome! Plus you can pick up some new albums while you're there and do your civic duty of supporting a local record store! Admission to this show is free and the bands are set to start around 1:30 p.m. If you plan on picking up some of those RSD releases (like the new one from Corey Feldman being dropped by Detroit's own Jett Plastic Recordings), we highly suggest that you get there early to get in line before the store opens at 9 a.m. Then grab some brunch and come back for an awesome show! UHF Records is located at 512 S. Washington in Royal Oak, MI. For more info on this event, click here. Party with White Shag at The Magic Bag TONIGHT! Village Vinyl Sets Up Shop in Warren! Berserker IV Feature - S.N.A.F.U. Win a Pair of Weekend Passes to Berserker IV!! !